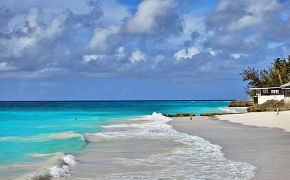 Barbados is served by regular international flights, and enjoys a steady stream of visitors throughout the year, but it is never overcrowded, as a result of which almost-deserted beaches can always be found, and facilities such as its 4 world-class golf courses are always easy to access - for a price. Accommodation for the traveller is a mixture of hotels and holiday homes, the latter often providing better options for those planning longer stays. Barbados is an attractive destination for those escaping the winter in the Northern Hemisphere, so holiday homes are springing up on the island with increasing regularity, and the prices for plots of land are high. Real Estate companies are well-represented by major intentional and local firms. Any first time visitor to Barbados will be absolutely bowled over by the sensational beaches, and it is impossible not to find real, simple pleasure drinking a Bank’s beer at Mullins Beach Bar whilst the sun sets over the Caribbean. But Barbados is more than a beach holiday. If time allows, and one starts to explore the island, there are real treasures to be found - from the Flower Forest to Crane Beach - and certainly enough treasures to keep the traveller coming back year after year, or, perhaps, simply staying for good.